This section is designed to help you learn about common service options. We have organized long term support services into seven main categories. Each category includes a range of care options. Simply click on a category for a list of services that are available in most communities. Get the information you need in order to make important decisions and to find providers, resources, and support. Products and services available to seniors and people with disabilities who wish to live independently in their homes and communities. Services include assistance with personal care and household tasks, home healthcare and home modifications. Community-based services offer support for individuals who live independently. 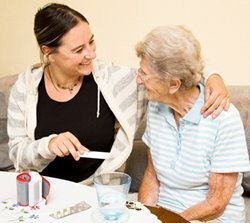 People often use a combination of community-based and in-home services to maintain independence. 24-hour medical attention for extended post-operative care or complex health monitoring. Options range from Assisted Living communities, where residents enjoy private apartments, to continuing care retirement communities which meets residents' health needs as they change over time. We work to provide unbiased information on assisted living and long term care. Our assisted living guides are written by medical professionals with years of nursing experience, and our state-specific guides cover rules and regulations in easy to understand terms. Hospitals, Rehabilitation and outpatient centers offer services for individuals with a wide range of medical needs. Caring for a family member or friend can be both challenging and rewarding. Finding the right resources can help. Learn about caregiver respite and support, grief recovery services, and caregiver education. Learn about a variety of services, including elder law, and abuse prevention. Find your local Area Agency on Aging, which can be a good source of additional information regarding services provided by their network and other agencies. For a list of Area Agency on Aging go the following link.